New Strategy for Mending Broken Hearts? 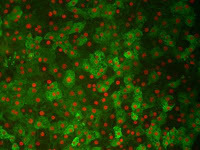 Patch created to repair damaged heart tissue Wednesday, 14 October 2009 By mimicking the way embryonic stem cells develop into heart muscle in a lab, Duke University bioengineers believe they have taken an important first step toward growing a living "heart patch" to repair heart tissue damaged by disease. In a series of experiments using mouse embryonic stem cells, the bioengineers used a novel mould of their own design to fashion a three-dimensional "patch" made up of heart muscle cells, known as cardiomyocytes. 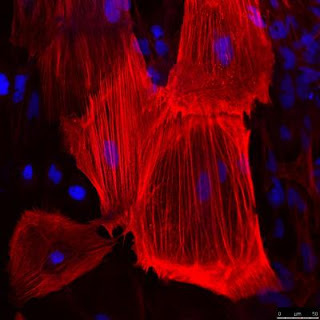 The new tissue exhibited the two most important attributes of heart muscle cells – the ability to contract and to conduct electrical impulses. 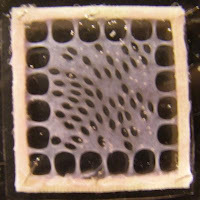 The mould looks much like a piece of Chex cereal in which researchers varied the shape and length of the pores to control the direction and orientation of the growing cells. The researchers grew the cells in an environment much like that found in natural tissues. They encapsulated the cells within a gel composed of the blood-clotting protein fibrin, which provided mechanical support to the cells, allowing them to form a three-dimensional structure. They also found that the cardiomyocytes flourished only in the presence of a class of "helper" cells known as cardiac fibroblasts, which comprise as much as 60 percent of all cells present in a human heart. "If you tried to grow cardiomyocytes alone, they develop into an unorganized ball of cells," said Brian Liau, graduate student in biomedical engineering at Duke's Pratt School of Engineering. Liau, who works in the laboratory of assistant professor Nenad Bursac, presented the results of his latest experiments during the annual scientific sessions of the Biomedical Engineering Society in Pittsburgh. "We found that adding cardiac fibroblasts to the growing cardiomyocytes created a nourishing environment that stimulated the cells to grow as if they were in a developing heart," Liau said. "When we tested the patch, we found that because the cells aligned themselves in the same direction, they were able to contract like native cells. They were also able to carry the electrical signals that make cardiomyocytes function in a coordinated fashion." New map of copy number variation in the human genome is a resource for human genetics Monday, 12 October 2009 In research published last week by Nature, an international team describes the finest map of changes to the structure of human genomes and a resource they have developed for researchers worldwide to look at the role of these changes in human disease. They also identify 75 'jumping genes' - regions of our genome that can be found in more than one location in some individuals. However, the team cautions that they have not found large numbers of candidates that might alter susceptibility to complex diseases such as diabetes or heart disease among the common structural variants. They suggest strategies for finding this 'dark matter' of genetic variation. Human genomes differ because of single-letter variations in the genetic code and also because whole segments of the code might be deleted or multiplied in different human genomes. These larger, structural differences are called copy number variants (CNVs). The new research to map and characterize CNVs is of a scale and a power unmatched to date, involving hundreds of human genomes, billions of data points and many thousands of CNVs. "This study is more than ten times as powerful as our first map, published three years ago," explains Dr Matt Hurles from the Wellcome Trust Sanger Institute and a leader on the project, "and much more detailed than any other. Importantly, we have also assigned the CNVs to a specific genetic background so that they can be readily examined in disease studies carried out by others, such as the Wellcome Trust Case Control Consortium.” "Nevertheless, we have not found large numbers of common CNVs that we can tie strongly to disease. There remains much to be discovered and much to understand and our freely available genotyped collection will drive that discovery." The results show that any two genomes differ by more than 1000 CNVs, or around 0.8% of a person's genome sequence. Most of these CNVs are deletions, with a minority being duplications. Chromosomes are shown colour-coded in the outermost circle. 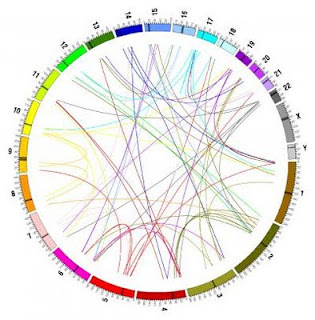 Inside are lines connecting the origin and the new location (where known) of 58 out of 75 putative inter-chromosomal duplications, coloured according to their chromosome of origin. Credit: Jan Aerts, Wellcome Trust Sanger Institute. Readily Available and Patient-specific Stem Cells Monday, 12 October 2009 Umbilical cord blood cells can successfully be reprogrammed to function like embryonic stem cells, setting the basis for the creation of a comprehensive bank of tissue-matched, cord blood-derived induced pluripotent stem (iPS) cells for off-the-shelf applications, report researchers at the Salk Institute for Biological Studies and the Center for Regenerative Medicine in Barcelona, Spain. "Cord blood stem cells could serve as a safe, "ready-to-use" source for the generation of iPS cells, since they are easily accessible, immunologically immature and quick to return to an embryonic stem cell-like state," says Juan-Carlos Izpisúa Belmonte, Ph.D., a professor in the Salk's Gene Expression Laboratory, who led the study published in the October issue of the journal Cell Stem Cell. Worldwide, there are already more than 400,000 cord blood units banked along with immunological information. Due to their early origin, cells found in umbilical cord blood contain a minimal number of somatic mutations and possess the immunological immaturity of newborn cells, allowing the HLA donor-recipient match to be less than perfect without the risk of immune rejection of the transplant. Human leukocyte antigen (HLA) typing is used to match patients and donors for bone marrow or cord blood transplants. HLAs are special surface markers found on most cells in the body and help the immune system to distinguish between "self" and "non-self." "Selecting common HLA haplotypes from among already banked cord blood units to create iPS cell would significantly reduce the number of cell lines needed to provide a HLA match for a large percentage of the population," says Izpisúa Belmonte. The endodermal layer, identified by markers AFP and FoxA2, will give rise to the digestive tract, lungs and bladder. 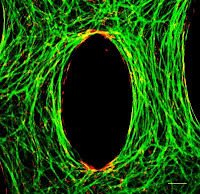 Credit: Courtesy of Juan-Carlos Izpisúa Belmonte, from Cell Stem Cell, Oct. 1, 2009. Since the first adult cells were converted into iPS cells, they have generated a lot excitement as an uncontroversial alternative to embryonic stem cells and as a potential source for patient-specific stem cells. Unfortunately, taking a patient's cells back in time is not only costly, but could be difficult when those cells are needed right away to mend injured spinal cords or treat acute diseases, and outright impossible when the effects of aging or chronic disease have irrevocably damaged the pool of somatic cells. "Patient-specific iPS lines have been advocated as a theoretically ideal clinical option to regenerate tissue but from a practical and cost-benefit aspect, this approach may not be feasible," says Izpisúa Belmonte. He hopes that the "large scale production and banking of cord blood-derived iPS lines in a publically available network could be a viable alternative for future clinical applications." With this in mind, Belmonte and his colleagues set out to transform hematopoietic stem cells isolated from cord blood into iPS cells. They not only successfully converted them using only two out of the four most commonly used factors — Oct4 and Sox2 — but also in less time than any other previously published methodology require. No matter, whether the researchers started with freshly collected cord blood or previously frozen samples, the resulting iPS cells were indistinguishable from human embryonic stem cells. The mesodermal layer, identified by ASM, will form bones, muscles, connective tissue and the middle layer of the skin. 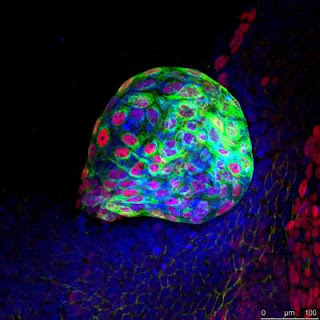 Credit: Courtesy of Juan-Carlos Izpisúa Belmonte , from Cell Stem Cell, Oct. 1, 2009.